The Fed’s liabilities settled down last week after a couple of weeks of wild fluctuations which resulted directly from the Fed encouraging banks to dress up their quarter end balance sheets with Fed RRPs. Now that those shenanigans are done until the end of December, a semblance of normalcy has returned to the balance sheet. “Normalcy” however excludes the fact that the Treasury is persistently withdrawing cash from its Fed account to pay down debt so that it does not run over the debt ceiling. This flows into bank reserve accounts as the Federal government pays off some debt holders, mostly Primary Dealers and other large institutional holders, and makes regular disbursements to other payees. This process will reverse when the debt ceiling is raised. The Treasury will start sucking the cash it has stuffed into dealer and other investor accounts back out of the financial markets. It will then spend that money into the economic stream. The markets should sag but the economy will probably continue trundling along at the same slow pace as the deficit spending juices the top line just enough to keep the numbers barely positive. If that happens, don’t get caught up in the idea that the economy needs to be entering recession to have a bear market. In the first leg of a bear market, the economic data usually still looks pretty good. When the econ data is really weak, that is when bear markets bottom out. Usually by then the Fed has been easing for a while. In this cycle the question is, “easing from what?” If the Fed decides to try negative rates, that will be a catastrophe, because negative rates are contractionary. And if the Fed decides to restart the old tried and true gambling chip of QE, it might work like it did before, which is to goose the markets while doing little to help the economy. Or it might not. If investors have learned their lesson and grow skeptical of QE, then it could be used to pay down debt rather than speculate in stocks or commodities. We’ll have to see when the time comes. Meanwhile, loan growth in the US continues to surge. 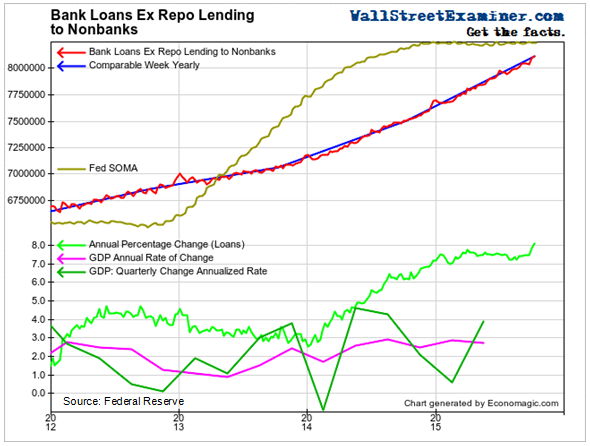 Bank lending (excluding repo lending) surged to an annual growth rate of more than 8% last week. This breakout in the growth rate suggests that rather than deleveraging, borrowers are getting even more aggressive and lenders are even happier to oblige, expanding the credit bubble at an accelerating pace. We’ve seen this act before and know how it ends. The only question is timing.